creative savv: One of my daughters did something really nice yesterday . .
One of my daughters did something really nice yesterday . .
. . . she put together a cook-out for the family. I'm sure part of this was a bit of self-interest, as she wanted a cook-out for the hot dogs and s'mores. And I also think she really wanted an evening of the family together. She surprised me with how well she thought out a menu using only what we had on hand. 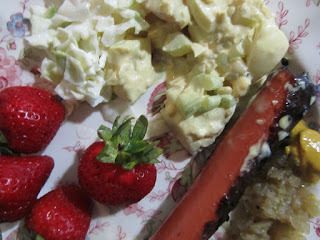 She even made potato salad for the very first time, and it was delicious (I had seconds). She asked about making hot dog buns, but I suggested we just use whatever we have in the freezer, which ended up being hamburger buns. Works just fine. The cook-out was fun, just sitting around the fire afterward. Although, the mosquitos ate me alive. We're in a bit of a heat-wave, here. The forecast is 93 for today, 87 for tomorrow. When you don't have A/C, that's pretty hot. How was your long weekend? Did you BBQ or have a cook-out? Or did you use the time to get a project done, or just relax? That's a great suggestion. I'm not big on bread-y stuff, so that would have worked for me, I think. What a nice break for you to not have to worry about making dinner. And your daughter did a great job. Kudos to you as a great mom. Labour Day weekend is always a day for harvesting/freezing/pickling in earnest. But we did have a wonderful Monday, relaxing on the deck and having homemade bruschetta for dinner. It was really sweet of her, and she practically insisted, which was extra nice. Your Labor day weekend sounds so wonderful and late-summery. Enjoy these last days to use the deck! That hotdog on a hamburger would have gone over well in our family also. I probably would have cut the hotdog lengthwise and opened it up to fit on the bun to fill it out! We went out for dinner with MIL for our anniversary which is today! Had a wonderful day off yesterday. Potato salad sounds so good but I used the last of my potatoes and probably won't buy some for a while. I'll see how far that takes me since I LOVE potates! When I was a kid, I got a cookbook (which some others here probably also had... I still have my copy), and they put hot dogs on hamburger buns by slicing them crosswise just enough to make them into a cirle, and then they filled the circle with pork and beans (or something). 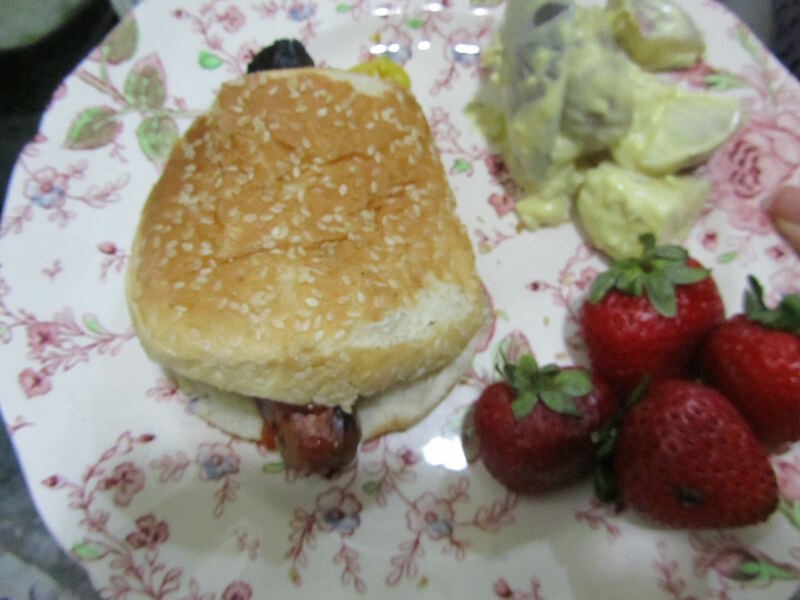 I like mine sliced lengthwise on wheat bread, as you suggested, but I've also done the hot dog "ring" on a hamburger bun, like Betty Crocker suggested, as well. :) Happy anniversary! some in our family cut their hot dogs in half, sideways, to eliminate the hot dog hanging over the edges of the buns. My mom used to split hot dogs lengthwise (open them up flat), for using slices of bread in place of buns. Whatever works, right? That was so nice of your MIL to take you and hubby out. Happy Anniversary! I'm trying to picture the circle hot dog thing. Sounds interesting. I'll have to dig out my mom's old cookbooks and see what suggestions they have for hot dogs. You just make slices from the side, most of the way to the other side, leaving enough that the slices don't fall apart. (This happened to me when I tried it as a kid.) The uncut parts work as hinges, so you can bend it around into a circle that sort of looks like a flower. If you use big hamburger buns and short hot dogs, it actually makes too small a circle. But with long hot dogs on the old-fashioned small hamburger buns, it works out okay. We have tried putting a hot dog and a half on, but they're harder to keep in a circle. Like hot dog buns, though, the hot dog will stay in better, if you squash the bun down a little bit around it. :) You could probably fill the center with something besides beans, if you wanted, or leave it empty, and just squish the center more. What a nice celebration--and your daughter did the work! I think it's a great idea to enjoy those end-of-summer moments. All too soon we will be putting on layers! We are having chilly weather here this week, actually, unlike your heat wave. I prefer the cooler weather but it does make it hard to know how to dress. I worked yesterday but my husband was off, so he grilled pork chops (really, pork loin cut into chops). We sometimes use a slice of bread instead of a bun if we are out of buns. I'm pretty sure store-bought hotdog and hamburger buns are the same "recipe", just shaped differently. I know, summer will be gone before we know it! We use slices of bread, too. I didn't have any bread at all that night -- it was the night before my Senior Shopping Day when I buy a month's worth of sliced bread at a discount. But a slice of bread is just enough bread for a hotdog bun, and commercial bread is soft enough to fold over. There's a flip side to the chilly weather -- being able to sleep better with cooler nights. So enjoy those! Have a great day,, Kris! What a sweet daughter you have. I've spent the last month canning including 11 chickens and 15 lbs of burger. Almost all veggies from garden are canned except potatoes and I hope to get free ones for that. Where we live it's big potatoes country and if the are too large or small they can't sell them . It costs farmers money to dispose of them so they give them away ! Our homestead is taking shape including chickens and apple trees we even have two kids now . Lol 3 and 5 Year old grandsons have been living with us . Our plans for a new house changed to adding on 1000 sq feet to the little house we can use the lumber we already purchased and not put out much more . I love having the babies but they have changed our plans . Hubs retired in Nov. And after finishing the house will probably go back to work . He's only 55 so he can have two retirements ! I always read your posts but rarely have time to comment. Thank you for all you do it is much appreciated . I agree, this was such a sweet thing to do for me and the rest of the family. That's a lot of canning you accomplished! You'll be grateful for all of that cooked meat later, in the winter. And the savings was probably very welcome, too. Your life with the 2 grandkids, chickens, orchard and garden sounds ideal. I am so happy for you to have put together this wonderful, peaceful little life on your homestead. How nice that your daughter took the lead on the family cookout. It's obvious that she has learned from the best. We spent Labor Day with my mother and enjoyed two nice walks outside with her. It was nice that we managed to get some in between the rain showers. Thinking of you, Ward, and your mom spending the long weekend together put a smile on my face. I'm sure you enjoy spending time with your mom, but I bet she especially appreciates these visits. I'm glad you were able to get outside for walks, too, while there. Have a wonderful day, live and learn! That sounds absolutely wonderful! What a great kid - of course, she learned from a great mom. We had a weird day today - high of only 69 with so much smoke in the air that the sun looked like a red ball. I think I'll make some potato salad tomorrow!